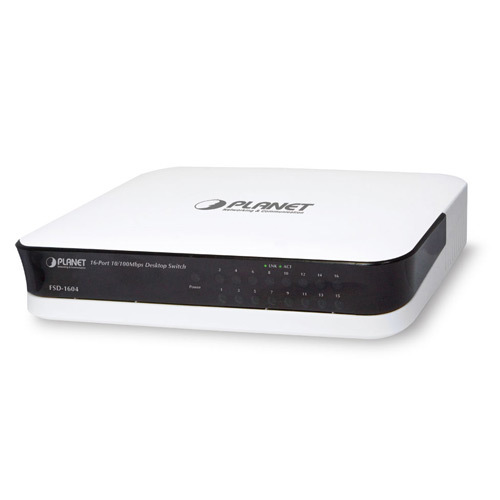 The brand-new PLANET FSD-1604 provides 16 RJ-45 10/100Mbps ports for high speed network connectivity. The FSD-1604 can automatically identify and determine the correct transmission speed as well as half / full duplex mode of the attached devices with its 16 ports. The FSD-1604 also supports Store-and-Forward forwarding scheme to ensure low latency and high data integrity. The high performance throughput (filtering / forwarding rate: 14,880 packets per second in 10Mbps, 148,800 packets per second in 100Mbps) and 2Mbit SRAM packet buffer help the FSD-1604 to boost bandwidth, eliminate unnecessary traffic, and relieve congestion on your critical server path. With an intelligent address recognition algorithm, the FSD-1604 could recognize up to an 8K different MAC address and provide 3.2Gbps switching capacity, which makes the FSD-1604 offer wire-speed packets transfer performance without risk of packet loss. The FSD-1604 is the fancy-shaped standard plastic model to fit into space-limited environment. With concepts of“Easy to install and use”, “Compact sized design”, and “Simple troubleshooting”, the FSD-1604 provides cost-conscious business and home users with the foundation from an integrated system of small-office / home-office networking. With one power ON/OFF button designed at rear panel of the FSD-1604, it can help users to reduce unnecessary power energy loss while the FSD-1604 operation is OFF. All RJ-45 copper interfaces in the FSD-1604 support 10/100Mbps auto-negotiation for optimal speed detection through RJ-45 Category 5/5e cables. Supporting standard for auto-MDI/MDI-X can detect the type of connection to any Ethernet device without requiring special straight or crossover cables. The Flow Control function allows the FSD-1604 to support routers and servers for direct connection to this Switch with fast and reliable data transfer. 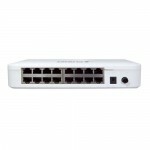 With 16 10/100Mbps ports, the FSD-1604 provides a cost-effective and high-performance solution for SOHO/SMB workgroup. To segment the network and ease the network traffic, the FSD-1604 is perfect for SOHO switched networks as the friendly network backbone. In addition, the network status can be monitored at a glance by the FSD-1604 providing array LED indicators.